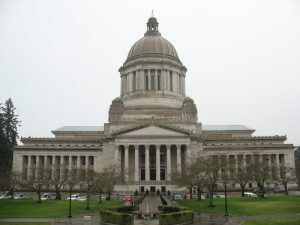 Washington State’s Capitol Building in Olympia. The Washington State Legislature was busy in 2017 — creating new laws and amending existing ones with the goal of strengthening the laws surrounding DUI offenses. The passing of House Bill 1614 resulted in changes to several areas of the Revised Code of Washington (RCW) concerning vacating criminal records, mandatory arrest, Ignition Interlock requirements and license suspension to name a few. You can read the bill in its entirety here. Increases time to vacate an impaired driving-related “prior offense” to 10 years. Increases Ignition Interlock Device compliance to 180 days. Requires courts to notify the DOL if a person willfully fails to appear or comply as required if they were provided notice of a traffic infraction or traffic-related criminal offense. A conviction for an impaired driving gross misdemeanor that is considered a “prior offense” can be vacated after 10 years as long as the person has not had any drug or alcohol-related violations. “Prior offenses” includes Negligent Driving (first degree), Reckless Driving (if the original charge was for drunk driving), impaired operation of a vessel (boating DUI) and deferred prosecutions for drug or alcohol-related driving offenses. Law enforcement officers are required to arrest a person and hold them in custody — without a warrant — if they have probable cause (PC) that the person has committed a drug or alcohol-related driving offense and has had a prior similar offense within the last 10 years. Examples of this include (but are not limited to) drunk driving DUI, prescription drug DUI and marijuana (cannabis) DUI. Prior to HB 1614, four months of consecutive violation-free days were required to release an ignition interlock restriction. With the passing of the bill, that time has increased to 180 days (six months). The DOL must suspend a person’s driver’s license if they willfully fail to appear or comply as required by a traffic infraction or complaint. With HB1614, courts are now required to notify the DOL when a person willfully fails to appear or comply — specifically if the person was provided notice of or served with the infraction or complaint. Reckless Driving, Negligent Driving, and Hit and Run are a few examples of criminal traffic offenses. I highly recommend Phillip Weinberg! I couldn’t have asked for a better attorney!